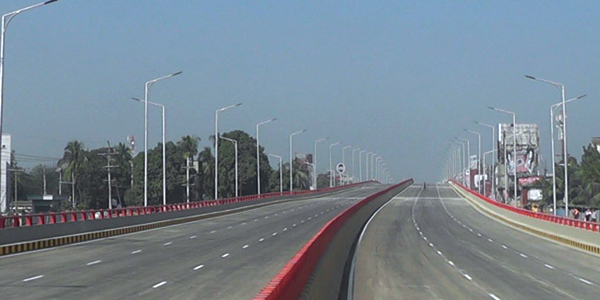 Dhaka – The first-ever six-lane flyover on Dhaka-Chittagong highway has been opened to traffic Thursday to facilitate smooth vehicular movement between the capital Dhaka and the country’s main port city Chittagong. Prime Minister Sheikh Hasina inaugurated the 660-meter long overpass at Mohipal of eastern Feni district. The construction of the bridge, having 1.37 kilometres of service road, began on April 1 in 2015 and completed six months ahead of its scheduled time. The flyover also connected Feni-Laxmipur National Highways. Engineering Construction Division of Bangladesh Army and Mesars Abdul Monem Limited implemented the project at a cost of Tk 181.48 crore. The flyover, having 11 spans and 132 guarders, is 24.62 meters wide. The government has been working relentlessly for the overall development of the county, Hasina said inaugurating the project. She said Mohipal crossing was a ‘misery’ for the travellers particularly for the inter-district passengers on this route. The flyover has been constructed considering their sufferings, she added. Hasina said the government has taken initiatives to keep the highways across the country dedicated for inter-district buses and introduce separate subways for local commuters. It will help reduce accident on the highways and make the travel more comfortable, she added.